Another day, another crumbling pillar of the ugly old internet finally collapses: The day after Microsoft announced it would deprecate MS Paint, Adobe has finally announced that Flash, the once widespread, and widely hated, web plug-in will halt release at the end of 2020, a little over three years from now. What’s left now is an incalculably sprawling cleanup operation that touches just about every corner of the World Wide Web. 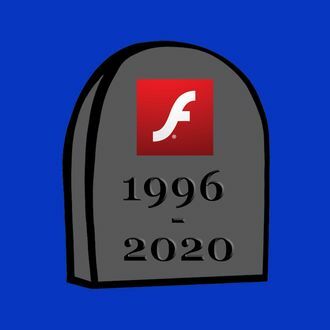 There’s a reason Adobe is giving three years’ notice: Adobe is developing tools and encouraging programmers to migrate their Flash content to other formats, but that is a decision left up to millions of individual websites and creators. What will become of Flash-powered sites like Homestar Runner and Newgrounds and approximately 14 bazillion spammy banner ads? (You can rest easy: QWOP has already been ported over). Upon hearing the news, Newgrounds founder Tom Fulp encouraged Adobe to open-source the software to aid preservation and emulation efforts. Archiving Flash content is a particular challenge that can’t just be fixed by having the Internet Archive store tons of data. The biggest problem is that Flash itself requires a client-side program, meaning that it runs locally on a user’s computer rather than from a remote server. So while saving .swf files is possible, displaying them, or playing them back in a browser, still requires this legacy (soon-to-be-dead) software. For the sake of technological progress, whole swaths of the early internet have now been given a concrete expiration date. The clock is ticking.